Because my previous article was getting rather long, I purposefully left a few Q posts out of it. But since they’re already a few days old, I’d like to include those with this one and also update folks on the Grassley memo that was released with far less redaction. U1 – a reference to the Uranium 1 deal in which Secretary of State Hillary Clinton sold roughly 20% of America’s uranium to Russia. AWAN, etc. – refers to the Awan Brothers spy ring in Congress. Not sure about the FBI informant but this informant is connected to the U1 deal. According to the tweet by John Roberts (Fox News), he said that one of his sources said President Trump “himself gave the order to the DOJ to life (lift) the gag order on Uranium One confidential informant.” We may then be hearing more about this in time. The U1 deal is interesting because Robert Mueller was involved in helping I believe to broker that. It is very possible that the uranium that Clinton sold ultimately went to either North Korea or Iran, via Russia. This is a bit ironic considering the MSM would have us believe that in spite of the great deals that Putin’s Russia got because of Clinton, supposedly, Russia actually wanted Trump in as president instead of Clinton. The reasoning simply doesn’t hold up though because Russia was already getting a good deal because of Hillary Clinton. Why would Russia want to turn that spigot off in favor of the unknown Trump? It makes absolutely no sense at all. This, however, is what MSM wants us to believe because in doing so, the Russian collusion narrative takes flight. The Awan brothers worked for the DNC and it was later learned that they most likely hacked servers to grab as much Intel as they possibly could. They either sold it or gave it to their own interests, which ultimately landed in the hands of “MB” – the Muslim Brotherhood. DWS is Debbie Wasserman-Schultz who was the chair of the DNC at that time, who also shut the door on anyone investigating their servers. The last line “Tarmac meeting [SC/LL deal > AS 187] is very interesting. Again, in order to understand these initials, it’s helpful to have been paying attention to what Q has been posting and watching the predictions come to pass. SC likely means Supreme Court. LL likely refers to Loretta Lynch. You’ll recall the “tarmac” meeting when Lynch boarded a stationary plane on the runway where Bill Clinton was? No one knows what they discussed and it was supposedly an unofficial meeting. Q is saying that the contents of that meeting is where Bill Clinton offered Loretta Lynch an appointment to the Supreme Court for her apparent cooperation in making the cloud over Hillary vaporize. The rest of that line is very sad. We’ve talked about the fact that AS often refers to Adam Schiff. Remember, I also said depending upon context, it could refer to Antonin Scalia, who was a Supreme Court justice who mysteriously died in 2016, I believe. That last bit – AS 187 – means this: Antonin Scalia was killed and since a vacant seat had opened up, Bill Clinton promised Lynch that Hillary would appoint her to the Supreme Court. The number “187” is penal code in some states like California for murder. Q is saying that Scalia did not die a natural death. He was murdered. Look back to a previous post about Q to learn more about what Q knows and how they know it. More than that, if you go back to this post – Q: 16 Years to Destroy America – you’ll see the breakdown of the “plan” in which Obama did certain things in 8 years and Hillary was to take the baton for the next 8 years in which she would put the finishing touches on America’s destruction including replacing Supreme Court Justices with individuals who bought into her vision. If necessary, individual justices would be removed through 187 to make room for new justices. About 12 minutes later, Q posts another post in which he reiterates what he posted previously and adds some. 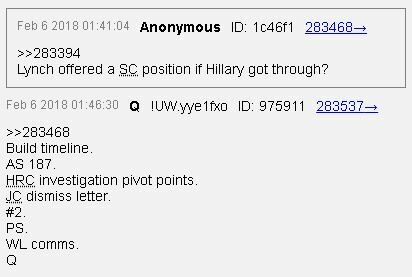 Q first tells Anonymous to “Build timeline.” He then repeats “AS 187,” and then states, “HRC investigation pivot points.” Let’s stop there for a few minutes and see what we’ve got. Basically, as far as the timeline of events goes, it looks like this and this information is based on many over on the Anonymous boards for their research. Bill Clinton met with Loretta Lynch on Monday, June 27, 2016, just a few months after Scalia’s mysterious death. According to the news, the meeting was “unplanned” and Bill simply saw her on the tarmac and called her over to his plane. At the time, Hillary was under investigation by the FBI regarding the email problem. It is likely – according to Q – that Lynch chose to go along with the plan and agreed to do whatever the FBI recommended regarding Hillary. Ultimately though, it is also interesting to learn that Lynch chose to remove her name from consideration in early March of 2016, which occurred before her meeting with Bill Clinton. She had previously been on several lists as a potential Supreme Court candidate by Obama. She may have felt that since she did not have an easy time being approved as Eric Holder’s replacement, it might have even been more difficult to receive approval for Supreme Court. Nonetheless, Q is telling us that the topic of conversation aboard that plane on the tarmac had to do with Lynch being on the Supreme Court and this time, it would be Hillary (as president) who would make that happen. The same person went onto say, “If – as I suspect — Ms. Kagan’s nomination is nothing more than an attempt by the Obama administration to tilt the Court in an activist liberal direction, the Senate has a responsibility to exercise due diligence and thoroughly vet her qualifications. This is no time for an automatic rubber-stamp approval.” Unfortunately, that is exactly what happened and since appointments to the Supreme Court are for the life of the person (or until they retire of their own volition), she will remain on the court. If all that Q is telling us is true – and I have little reason to doubt the veracity because of how often Q is correct – then there is really a thoroughly repugnant, rotting swamp under DC. It’s taken years to get to this point but if we simply stop to consider the fact that some of the most outspoken Democrats in Congress are willing to shut down the government because of people who are illegally here, effectively holding the rest of America hostage for them and their illegal status, it provides us with some insight into the way they think. Since the first memo from the Intel Committee has come out, another memo, this one from Sen. Grassley has also come out that is much less redacted than the first one released. You can download a copy here. In truth, the memo is very damning because of what it reveals. Proof of this is the fact that most MSM won’t even discuss it. They cannot refute it so in true form, they essentially ignore it. 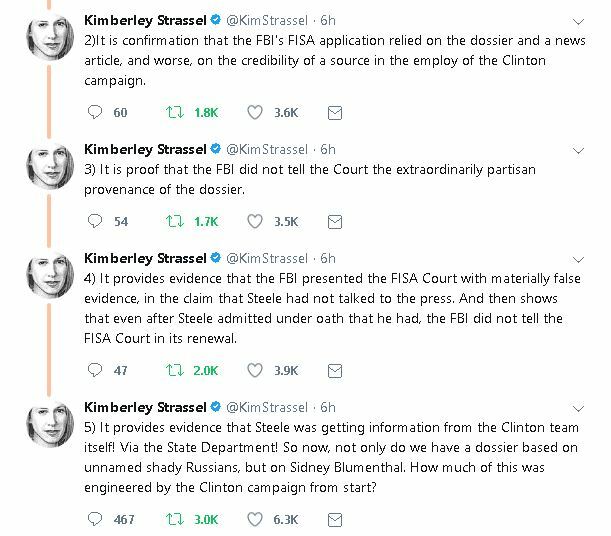 Investigative reporter Kimberly Strassel has issued a summary as to why this memo is so important. You can see her reasons in the image of her tweets on Twitter. Click on the image to enlarge it for easier reading. In spite of the fact that James Comey and others tried to use false bravado to pretend they’re not worried about potential indictments coming their way, Strassel nails things down. Regardless of what many on the Left may think, a fair and objective court will see things as she understands them. In essence, the FBI colluded with the DOJ to pull one over on the FISC in order to gain a FISA warrant and then to have it renewed on three separate occasions. 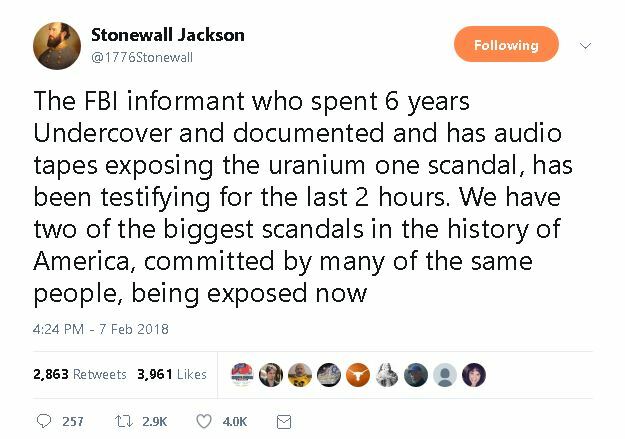 The scope of deception is breathtaking really because it speaks to how badly the FBI had been weaponized because of the corruption of those at the top. I feel badly for the average FBI agents because they do not share in the condemnation deserved by James Comey, Andrew McCabe and others. These men used their power against an American citizen running for the highest office of the land and all because they personally supported Hillary Clinton. This is not only a disgrace but it is truly criminal. A case can be clearly made for treason here and that is no joke. 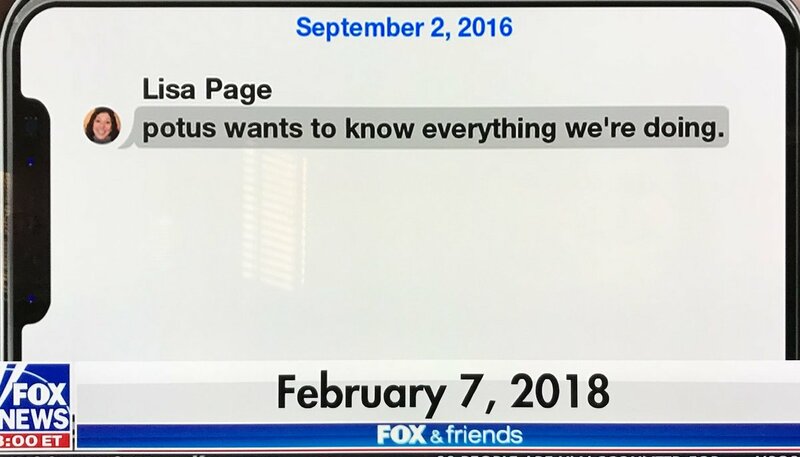 If the text messages between Strzok and Page are true (and why wouldn’t they be since they never thought those messages would become public? ), then clearly Mr. Obama lied. He wanted to know everything and be kept up to date on things. It is also very interesting to learn what Strzok and Page thought about James Comey, McCabe, McConnell, Ryan, Trump and others. They let it all hang out in their texts, even referring to the people in the district where Andrew McCabe’s wife ran for office as “ignorant hillbillys (sic).” It is very clear from these texts that both individuals despised Donald Trump, yet Strzok was originally part of Mueller’s investigation into the alleged Trump-Russia Collusion. After Trump won, the two talked of how depressed they were about the whole thing. They couldn’t believe it, just as Hillary still cannot wrap her brain around it. One of the texts went onto even acknowledge Watergate, saying, “I bought all the president’s men. Figure I need to brush up on watergate.” (Page) Wonder why? Could it be they obviously knew what they were doing where Trump was concerned was similar but far worse than Nixon’s attempt to tap a phone line in the DNC? This level of corruption appears to be just the tip of the iceberg. We have no idea where it will go from here, though I think we can safely say that what we will learn from this point onward is going to be far worse. We can all hope and pray that this will end with many indictments and prison at the least. If it does not, then we can be guaranteed that this will happen again. A very strong message needs to be sent to these individuals who have corrupted the rule of law for their own benefit. 9/WW may mean Obama retained 9 lawyers throughout the world. But he DID lawyer up according to Q. Not too long ago, Q noted that Barack Obama (Q refers to him as “HUSSEIN”) retained an attorney. He has lawyered up and Q also pointed out that when we hear the name(s) of his attorney, we should do some research to see his military law background. The implication of course is that Obama may well find himself in front of a military tribunal. If so, the potential penalty could be death. We will keep everyone posted and thanks to those who provided opinions about their druthers regarding posting politically related articles. If I don’t cover it, remind me to tell you what really happened (according to Q), with respect to the false incoming nuclear alert in Hawaii not that long ago. Fascinating tale! Entry filed under: 9/11, Agenda 21, Atheism and religion, Barack Hussein Obama, christianity, Communism, Council on Foreign Relations (CFR), Cultural Marxism, Demonic, devil worship, Emotional virtue, eternity, Global Elite, Political Correctness, Politically Correct, Politics, Religious - Christian - End Times, Religious - Christian - Prophecy, Religious - Christian - Theology, salvation, Shadow Government. Tags: collusion, comey, doj, FBI, mccabe, obamagate, page, strzok, watergate. Thank you. Yes, the DS hates Trump because he’s an outsider. Moreover he’s not a politician. He was not supposed to win. On one hand yes, it is very sad the way forced have risen up against him like this. On the other it is good to see progress being made against DS. So grateful for what Q team is revealing.